Former Liverpool captain Tommy Smith, who helped the club to domestic and European success in the 1960s and 1970s, has died aged 74. Known as the "Anfield Iron", Smith had an 18-year career at Anfield, during which he won four league titles. 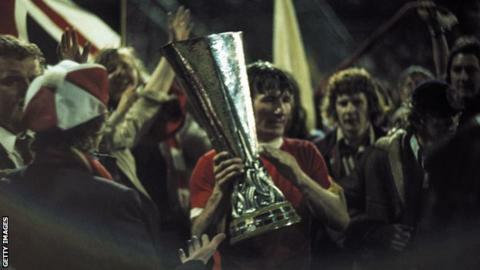 He scored in the 1977 European Cup final as Liverpool beat Borussia Monchengladbach 3-1 to win the trophy for the first time. Liverpool said that they were "deeply saddened" by his death. Smith, who made 638 appearances for the Reds between 1960 and 1978, had struggled with dementia and other ailments during his later years. His daughter, Janette Simpson, told the club website on Friday: "Dad died very peacefully in his sleep shortly after 4.30pm today at his nursing home. "He had been growing increasingly frail and suffering from a variety of ailments over the last three months especially. "We are obviously all devastated." Former Liverpool manager and player Roy Evans paid tribute to Smith, who was his best man at his wedding. "It's a big loss and I know he's not been very well for a year now," Evans told BBC Radio 5 Live. "He was a great guy; he helped me through my career. "He was a normal guy. We had a lot of fun together. He used to look after me when I first came to Liverpool. We'd go out and have a couple of beers. "On the pitch he was very physical, but he was also a very good footballer. He was a leader. There will be a lot of very sad people tonight." Former Liverpool midfielder Kenny Dalglish said Smith helped him settle in when he made the move from Celtic to Merseyside in 1977. He told the club website: "Smith was a fantastic servant. He was a great advert for Liverpool football club. It's very sad to see him go, but his memories will be there forever. Former Liverpool defender Jamie Carragher tweeted that Smith was "one of the club's all-time greats", a sentiment echoed by Reds chief Peter Moore, and ex-striker Michael Owen said he was a "legendary player". "He was a Liverpool great, a really good player and a beautiful striker of the ball. He played in the midfield and in the defence, and he took no prisoners. "Tommy was a leader of men. Just to be able to play three positions in an outstanding team was great. "All he ever wanted to do was play for Liverpool and the reason he played so many games was because he played injured. He really was a Liverpool legend in every single way."